Local Delivery now available! 4:00pm-10:00pm everyday, minimum $5 delivery charge. Please call (905) 655-3100. 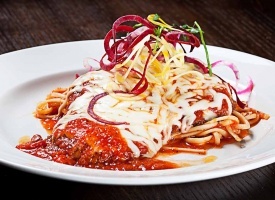 Corrado's Restaurant and Bar is your choice for Italian cuisine and is located at 38 Baldwin Street in Brooklin (North Whitby). It is located on the corner of Baldwin Street (Highway 12) and Cassel's. We have been serving the Durham region and more since October 2010. It is the First location of its kind and is privately owned. The building is unique in that the original structure was built in 1863 as a private residence. Family dining is available for our customers on the main floor. 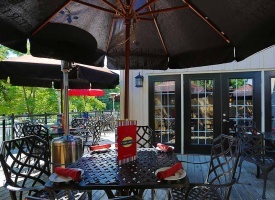 We also offer adult dining upstairs for that more intimate setting. Take-out and gluten-free friendly options are available. The history of its ownership can be found in the framings that are currently hanging on the walls of Corrado’s Restaurant and Bar. The history of its Corrado's ownership can be found in the framings that are currently hanging on the walls of Corrado's Restaurant and Bar. In the summer of 2009 the building was purchased by Corrado and Karen Tomarchio. The intention was to restore the historical existing building and expand it to provide a Corner Stone Italian Style Restaurant for Brooklin with a contemporary , casual feel , while still capturing the old world charm from its history. The restaurant provides many layers of service. Contemporary Casual for all families to feel at ease and enjoy a great meal, Upscale casual dining on the second floor of the restaurant set in the Historical Room, where you can have a more private adult dining experience. A warm and welcoming “escape from the day” bar area where you can relax and have a snack and Great take out services to meet the needs of the ever busy population of the Town of Brooklin. 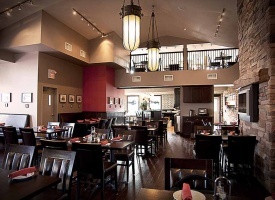 Corrado's mission is to enrich the lives of our guests, our employees and owners. We do this through superior quality food and beverages, legendary customer service, and treating our employees like family. We believe that our employees are our most important resource and our success depends upon creating and retaining a staff capable of delivering an exceptional dining experience to every customer, every time.